Last weekend, I photographed Stacy and Mike’s Scotland Run Golf Club Winter Wedding in Williamstown, NJ. 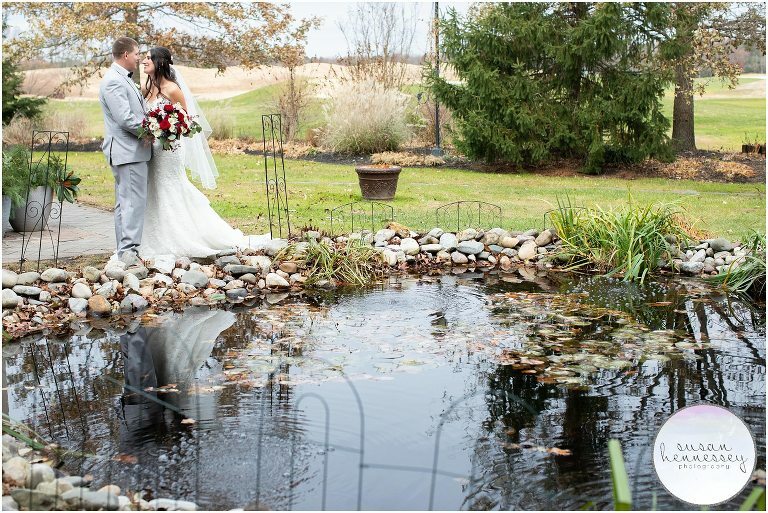 Stacy and Mike had a beautiful and perfect day for their modern and classic wedding with a little touch of rustic. 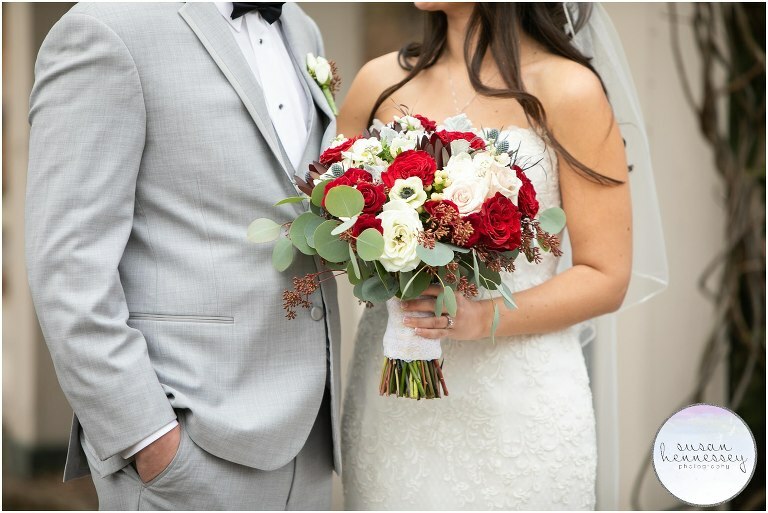 Between Stacy’s gorgeous bouquet filled with roses, anemones, thistle, dusty miller and Eucalyptus and the love between these two, we had a wonderful winter day at Scotland Run! Mike and Stacy first met at a local bar in April of 2014. Stacy was out for her best friend’s birthday, the girls had invited some friends to join and Mike happened to tag along with those friends. They started talking that night and have not gone a single day without talking since. Their first date happened to be at the same bar the next evening. The bar was giving away XTU tickets which Mike wanted to win, not only did they win tickets but they had a successful first date! Their day started perfectly at a nearby hotel, my favorite hair and makeup team, I Do Hair & Makeup was busy getting all the ladies ready for the day. I loved photographing Stacy’s details and was in love with the detail on her dress! 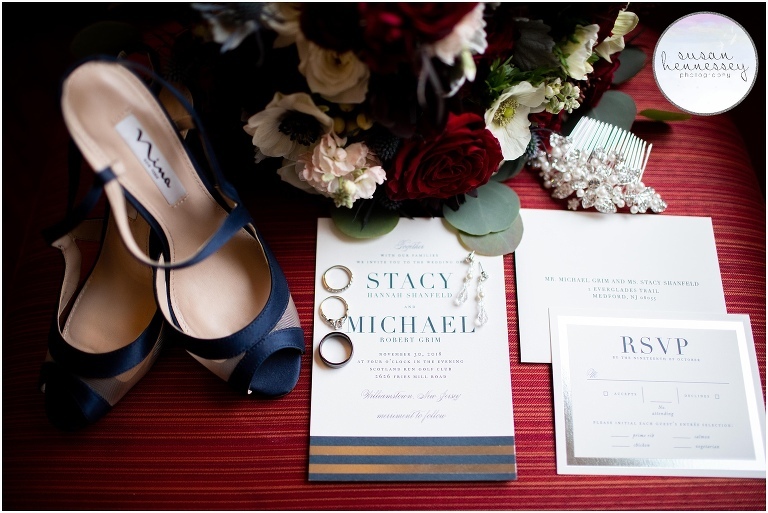 The red and whites in her bouquet complimented the navy blue of her bridesmaids so perfectly. 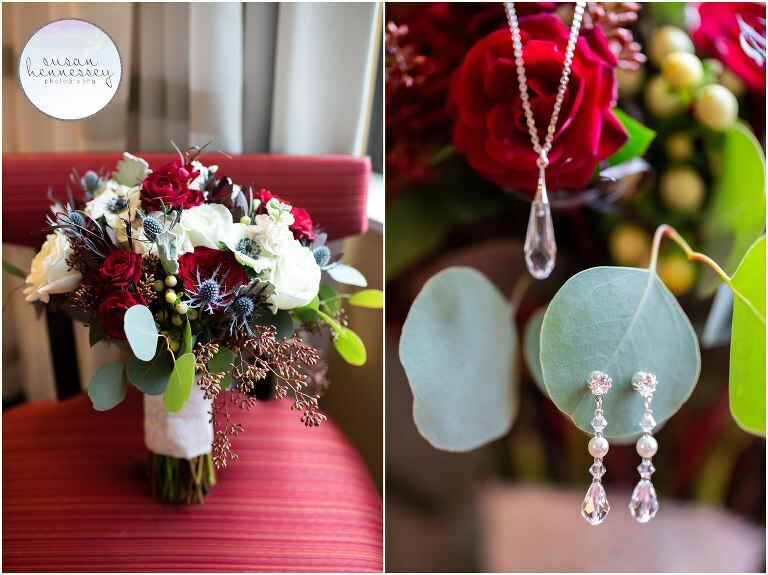 Once everyone was ready, it was time for the first look at their Scotland Run Golf Club winter wedding. This was my first winter wedding at Scotland Run and the venue did not disappoint. They have such lush greenery during the warm months that I was so impressed with how gorgeous the grounds were even though it was winter! We also had the golf course to ourselves it seemed, which never happens in the warmer months. After portraits were complete, they had a short and sweet ceremony followed by a fun reception with Center Stage Entertainment keeping the dance floor packed all night! Before the night was over, I was lucky enough to get this group outside for a fun sparkler exit! Thank you to Stacy and Mike for allowing me to capture your beautiful Scotland Run Golf Club winter wedding! Now that they are finished planning their Scotland Run wedding, they enjoy spending as much time together as possible. They enjoy going out to different restaurants, camping, going to breweries, and hanging out with friends and family. Their dreams for their future is to stay happy and healthy. They would love to travel and work on their home together. After they travel a bit, they plan on settling down and having children. Stacy and Mike are planning a honeymoon for early next year. Are you planning a Scotland Run Golf Club winter wedding? Click here to view all the other weddings I have photographed at Scotland Run! And if you’re ready for more info, click here to fill out my contact form.